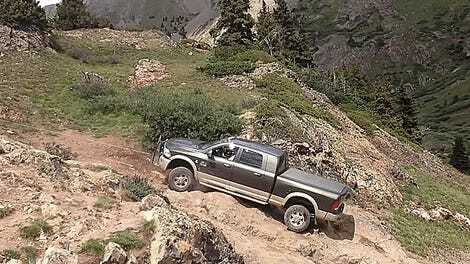 If you want to travel far off the beaten path, you usually start with a big truck. 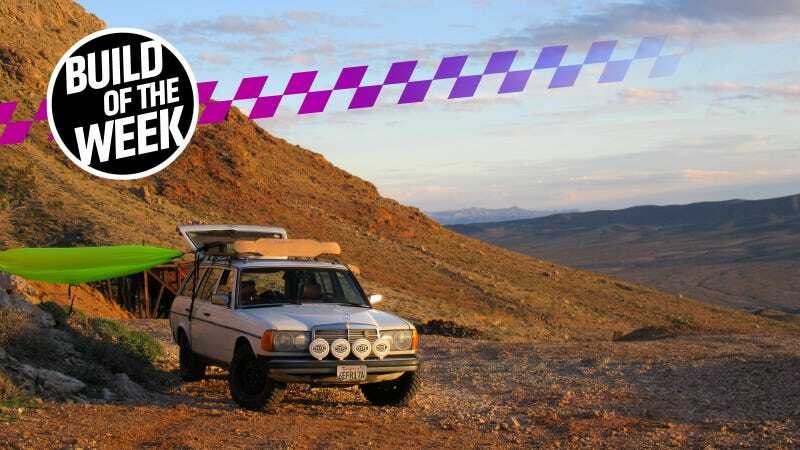 Not so for Neil Markwardt, who’s slowly been making a 1985 Mercedes 300TD into the ultimate off-roading wagon. Here’s how he did it. “I just love wagons, diesels, and getting weird looks,” he told Jalopnik. For a car that’s meant to take the kids to school, it’s been easier than it looks to lift it up and take it overlanding. Manfred, before the most recent mods in progress. Markwardt bought “Manfred the Mercedes” about two years ago, and in that two years, it’s lived a surprisingly robust and dirty life. It’s been to Death Valley, Joshua Tree National Park (twice), the Tecopa Mines district just south of Death Valley, and up to Oregon and Northern California for last August’s big solar eclipse. He’s already planning some kind of Sierras expedition for the summer, too. But to him, it was the perfect car. The car came with around 197,000 miles on it, but it led a shockingly gentle life before Markwardt got it. It needed some routine maintenance items, but was otherwise in good shape—especially on the inside. It even came equipped with a third row of jump seats, which feels like a must for any 1980s wagon. Maroon mudflaps were soon added to match the car’s pinstripes. Overlanding originally wasn’t in the plans, but then he saw just how big the wheel wells are. Markwardt had run an SAE Baja team in grad school, so he knew that was a big part of getting it to go off-road successfully. “Adapting a vehicle to do something it was never intended to do can be a fun challenge,” Markwardt said. And my goodness, this one looks fun. The build started with a mild lift and big tires about six months after Manfred was purchased. Enlargening the center hole on the wheels with a milling machine. One of the new wheels with the spacer needed to make it work.Note the difference in size between the wider center hole of the spacer and the smaller hole in the wheel. This is why Markwardt had to machine out a bigger space for the hub. New wheels and tires vs. old wheels and tires. He found 15x6 steel wheels in the Merc’s 5x112 bolt pattern for $35 a pop on Summit Racing, but 10-millimeter spacers were needed to make them fit as they had a deeper offset than the stock wheels. He also had to machine out the non-hub-centric wheel design to make it work with the hub-centric car. Since the wheels required conical seat lugnuts instead of the stock Mercedes ball seat lugs, a set of longer BMW wheel bolts were sourced to clear the spacers and fit the tires on the car. Fifteen-inch wheels in place of the stock 14-inchers then opened up a much wider selection of tires, so he picked up a set of BFGoodrich Mud Terrain KM2s in 215/75/15—the smallest size they had for that tire. The meatier wheels and tires tires fit, but just barely, so it was time for what Markwardt deemed “precision adjustment of the fenders with a large hammer,” some manipulation of the steering stops and of course, a mild 2-inch lift. A new spring pad (left) was about 3/4" taller than the stock part (right) on its own. That lift came thanks to stiffer spring perches in the front, polyurethane rear bump stops and stiffer springs designed for owners who eliminate the car’s hydraulic self-leveling system. However, Markwardt retained the W123's stock self-leveling struts for now, and that hydraulic self-leveling rear suspension has been both a blessing and a curse. On one hand, you can haul up to around 1,000 pounds of cargo before the ride height is affected. On the other hand, a blowout can be catastrophic. Tire rub from a blown strut in Death Valley. That blowout made the trip back onto the pavement pretty hairy, as the rear of the car was left resting on its bump stops without any damping. 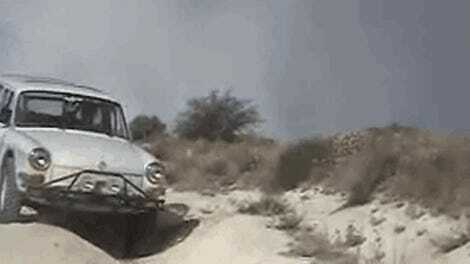 While he made it home fine then, off-roading with an undamped suspension is a surefire way to get beached in the sand. Fortunately, Neil says that happened only once. The stock rear tires were also swapped back on to make it home, as the compressed suspension caused the tire to rub. Digging out from getting beached in Death Valley. This is what’s prompting Neil to add a Hi Lift jack mounted to the rack. Custom roof rack made from reclaimed wood. After the suspension was sorted enough, Markwardt added an utterly gorgeous roof rack made out of reclaimed Douglas fir tongue-and-groove flooring. Four Hella FF700 driving lights also made their way onto the front bumper for extra visiblity out in the land of no street lights. Maroon mudflaps were also added to match the pinstriping and interior. To protect the car from any major, wagon-stranding kind of damage, he also added a Mercedes oil pan skidplate. A five-inch C-channel rear bumper was added to replace the stock bumper after it came off on the car’s second ever trip to the Tecopa Mines area. Losing the rear bumper in the Tecopa Mines area after getting the departure angle wrong on a ditch. He’ll have to fabricate custom shock mounts to make this work, but it should be worth it in the long run. Front bumper parts, ready to weld together. The new front bumper welded into place. A close-up of where the new bumper ties in to the shielding under the car. Markwardt also just finished welding up a meaty 9,500-pound winch-equipped front bumper for the car this week. He plans to replace both of the existing bumpers with custom steel plate ones. Getting fabricated soon is a mount on top of the roof rack for a vintage Hi Lift jack from Markwardt’s great grandfather’s farm outside Hillsboro, Texas. The patina on this jack matches the look of the car better than a shiny new one, plus it’s got that cool family connection. An injector rebuild is also on the short list of items to take care of soon. Eventually, he wants to solve the biggest off-road limitation of the car: its open differential. Open differentials tend to send all the power to one tire when the rear wheels lose traction, which isn’t good for burnouts or off-roading. He wants a locking differential in its place (which forces both rear wheels to spin in unison regardless of which one has traction), but it hasn’t happened yet since there’s no good bolt-in replacement for the car. Manfred’s first trip to Joshua Valley National Park. Another thing that hasn’t happened yet is a manual transmission swap. Yes, he’s been wheeling this thing with the stock Mercedes automatic. “I was planning on putting a Mercedes four-speed manual in it initially, but the first gear is too tall for the technical/steep stuff, so I’m sticking with the slushbox for now,” Markwardt said. His dream drivetrain would keep the quirky five-cylinder diesel, but add the NSG370 six-speed manual transmission from a Jeep Wrangler that’s had the outboard parts of the transfer case taken off to make it a two-wheel-drive low-range gearbox. Overall, this car’s transformation into an overland toy was shockingly simple. All I want to do now is go out into the wilderness in a good battle wagon after perusing Neil’s photos and hearing how simple it was to do, despite the fact that I’m already out of room for cars. If you want to keep up with Manfred the Mercedes, Neil frequently posts updates on the car to his Imgur albums here. Wearing the muddy marks of success after an early run.